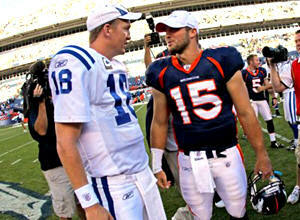 Peyton Manning, left, and Tim Tebow in 2010.
according to ESPN. Manning also called the San Francisco 49ers and Tennessee Titans to inform them of his intent to play for Denver, they reported. Manning will be the next quarterback of the Broncos, unless there are unforeseen problems in final contract negotiations. Once the Manning deal becomes official, Denver will initiate efforts to trade Tebow, ESPN noted. Denver’s team was 1–4 before Tebow became the starter, but immediately began winning with him on the field, often by coming from behind late in the fourth quarter in spectacular –even “miraculous” ways, until they won the AFC West title. Tebow, the son of missionaries in the Philippines, has evoked strong emotions from critics and fans — ranging from adulation to disdain – but it never fazed him. Some criticize his throwing motion, some his reliance on an unorthodox option offense. Some believe the attacks may have been a thinly veiled response to his bold proclamations of faith. Off the field, Tebow’s foundation is partnering with CURE International to build a 30-bed surgical facility for children focusing primarily on orthopedics on the island of Mindanao, where his parents are based. No glitches are expected in the final contract details between Manning and the Broncos. Elway and Manning first discussed the parameters of a five-year, $95 million contract during their March 9 meeting in Denver, the first time the quarterback visited a team during his free agency, ESPN reported. ESPN NFL analyst Mark Schlereth maintains the Broncos were never sold on Tebow. Many seem to think Manning will be a better fit – “a kindred spirit” – with Elway and the Broncos. Some Broncos players celebrated the news on Twitter; other analysts thought Manning should have picked the 49ers instead. Tebow led the Denver Broncos to an 8-8 finish, an AFC West title and a first-round playoff victory over the Pittsburgh Steelers.